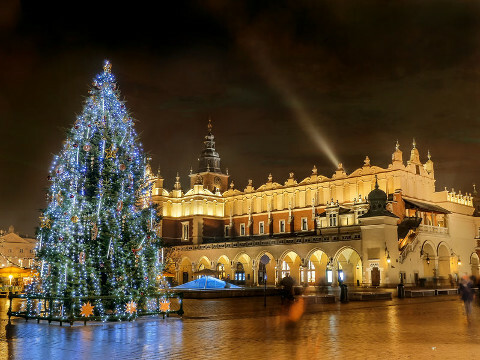 A Christmas tree beside the historic Sukiennice (Cloth Hall) in Kraków, Poland’s second city. In its heyday in the late Middle Ages, Kraków was Poland’s capital and a major hub of international trade. Merchants would flock to the Cloth Hall in the main market square to discuss business and strike deals – not just in cloth and silk, but in leather, spices and wax too. But after the capital moved to Warsaw at the end of the 16th century, Kraków’s fortunes declined and the Cloth Hall fell into disrepair. It wasn’t until the late 19th century – by which time Kraków was under Austrian rule – that the building was renovated, with great success. The upper floor was given over to a Gallery of 19th Century Polish Art in 1879, which has been a major cultural destination ever since its opening. Kraków Old Town has been a UNESCO World Heritage Site since 1978. The Cloth Hall is a major showpiece within it. This entry was posted	on Friday 30 November 2018 at 13:02	and is filed under 2018, British Expat Latest, Poland. You can follow any responses to this entry through the RSS 2.0 feed. You can leave a response, or trackback from your own site.